The Muhammadu Buhari administration was, yesterday, counting its successes after three years, saying no administration has equalled it in doing so much with so little. Speaking at a press conference in Lagos, the Minister of Information, Culture and Tourism, Alhaji Lai Mohammed, enumerated what he described as the administration’s strides in infrastructure, security, social security, power, anti-corruption among others. While noting that no inch of Nigerian territory was currently occupied by insurgents, Mohammed said the administration’s successes had become evident to all with the resumption of flight services to Maiduguri. Listing some of the achievements of the Buhari administration, Mohammed said: “In just three years, the Buhari administration has taken power generation to an all-time high of 7,000 Mega Watts, from the 2690 which we inherited. “In just three years, this Administration has moved Nigeria closer to self-sufficiency in rice more than any Administration before it. It’s just two years away from meeting its target production of 6 million MT of milled rice, meeting Nigeria’s consumption. “In just three years, this administration has increased the number of rice farmers from 5 million to an all-time high over 11 million “In just three years, this Administration has cut Nigeria’s rice import bill of $1.65 billion annually by 90%, the highest such cut ever. “In just three years, this Administration has slashed leakages in government spending that made corruption possible, thanks to the diligent implementation of the Treasury Singles Account, TSA, and the hugely-successful Whistle-Blower Policy. “In just three years, this Administration is feeding 8.2 million pupils in 45,394 schools in 24 states, employing 87,261 cooks in the process. “In just three years, this Administration has been paying conditional cash transfer of N5,000 monthly to 297,973 poorest and most vulnerable households. “In just three years, this Administration has delivered 10 million, 50kg bags of fertiliser at a low price N5,500 (for 2017 alone). The country now has annual savings of US$200 million in foreign exchange and ¦ 60 billion annually in budgetary provisions for Fertilizer subsidies. The achievements he said were against the background of the security threats inherited from the preceding administration that saw the Boko Haram insurgent group occupy a portion of the country equal to the size of Lebanon. In the fight against corruption, he said that the Whistle Blowing Policy introduced by the Federal Ministry of Finance in December 2016, N13.8bn from tax evaders, N7.8bn, $378million, £27,800 in recoveries from public officials targeted by whistleblowers. Mohammed said that the Buhari administration had been able to ensure return to normal life in the Northeast with the resumption of air flights and sporting activities to the region he said had been cleared of Boko Haram insurgents. 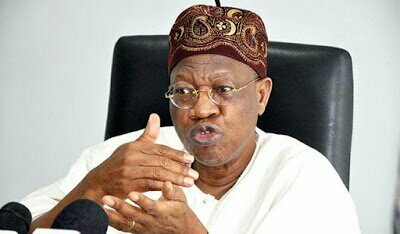 0 Response to "No Govt In History Has Done So Much With So Little As Buhari’s – Lai Mohammed"